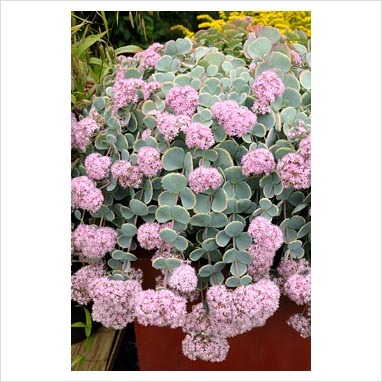 This wonderful Sedum gets its pink flowers in late summer, but its main attraction is the year round fine textured blue foliage . Will grow to 3" tall. Plant in full sun to light shade. 'Acre' has a height of 2" is easy to grow in any ordinary well drained location. Tolerates heat, drought, and poor soil. Water sparingly. A reliable ground cover for any location. Especially useful in rock gardens and containers. Bright yellow needle like foliage. This wonderful plant spreads to form a lovely carpet of color. Cluster of yellow flowers rise above the plant in summer. Angelina Sedum tolerates dry, poor soil. Plant in full sun. Angelina will get 4-6" tall. This is one of Mark's favorite plants to use in rock gardens and borders.